A modern look with classic styling. Powder coated aluminum frame with Tekwood natural seat and back. Beautifully made Tekwood natural seat is both stylish and comfortable. Tekwood in natural finish is a wood-alternative developed from polystyrene, giving the look of teak without the maintenance. A modern look with classic styling. Powder coated aluminum frame with Tekwood natural seat and back. Combine with our Travira Tekwood natural table for a beautiful display and decor. The powder coated aluminum frame creates a sturdy and yet light chair. Beautifully made Tekwood natural seat is both stylish and comfortable. Tekwood in natural finish is a wood-alternative developed from polystyrene, giving the look of teak without the maintenance. * Ships in quantities of four. ** Available in quantities of two for an up-charge. 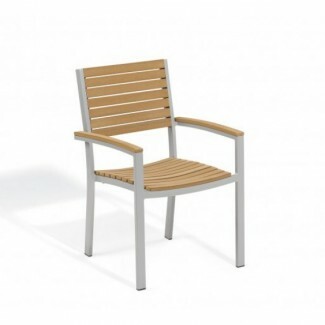 This piece in our Aluminum Teak Composite Seating Collection is In Stock, with a lead time of 1.5 - 2.5 weeks from the time your order is processed. Single Item 2 pk. - $229.19 ea. 4 pk. - $229.19 ea.